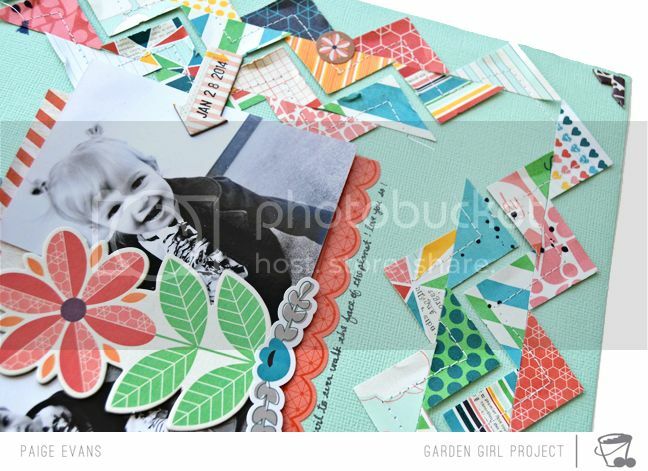 I have a milestones-themed Garden Girl layout up at Two Peas in a Bucket today! Description: The Capture collection by BasicGrey? Amazing. Seriously, they've been knocking every line out of the park lately. Oh to be on their design team :) But anyway, the colors are a bit bolder version of the 2Peas April moodboard but that's where I drew my inspiration - the colors. And then I used one of my favorite techniques: punching patterned papers and piecing them together! Regarding the "milestones" theme - I think 18 months is a big milestone! A year and a half is when kids can enter Nursery at church and really it's just the cutest and most fun age of babies in my opinion. I dressed Jane up and got lots of pictures of her to scrap! Journaling says: I'm pretty sure you're the cutest little girl to ever walk the face of the planet! I love you so! How to: Punch 1" squares from each of the papers in the 6x6 paper pad and the 12x12 papers in the Capture collection by BasicGrey. Cut each square in half to make triangles. 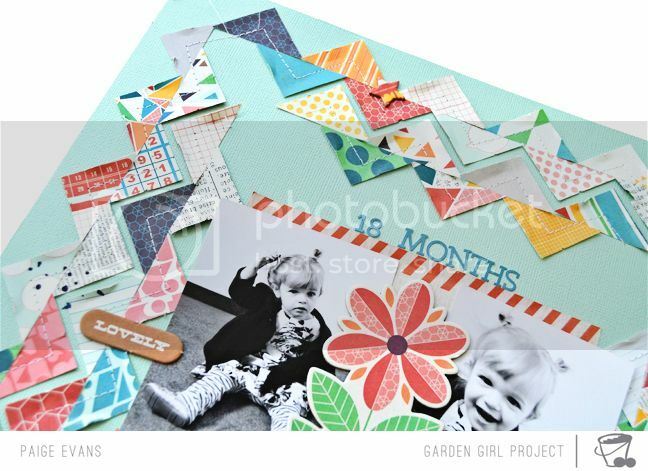 Place the triangles in chevron stripes around the edges of a robin's egg blue cardstock layout base. Use a sewing machine to stitch over the chevrons. Place a journaling spot page on the center, top it with two photos, and embellish with a scalloped border sticker, chipboard flower, flower sticker, chipboard arrow with the date stamped on it, chipboard "lovely," and journaling written below. Drop dark blue spray mist around the layout and place a chipboard photo corner on each corner. Thanks for takin' a look'! I had fun making this layout and it came together FAST! I was able to film the entire thing during my kids' afternoon nap - love when that happens! This is gorgeous! I loveeeeeee those sweet photos and all the triangles!! And you are so right .... BG is just rockin' the collections lately!!!!! Man! I don't know how you can always come up with such incredible stuff! Wow! 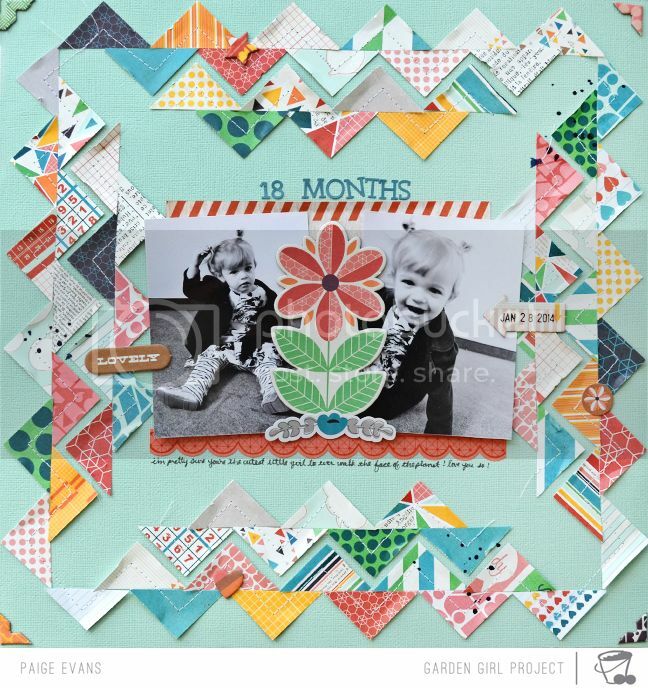 Love the fun triangles around your layout, Paige! And the flower is so cute between the two photos!